The government of Nepal made a decision to change the rules of writing in Devanagari script in which the Nepali language is based. This decision was taken five years ago without consensus among linguists to reportedly maintain uniformity in the written and phonetic forms of the Nepali language. According to the new rules, the practice of writing the ‘half alphabet’ and ‘joint alphabet’ would come to an end and school curricula needed to be revised accordingly. Today as debates over the issue continue, many confess to being confused and disappointed by these forcefully implemented changes. Padam Prasad Siwakoti, director of Pairavi Prakashan, says that given the changes that are being made, everyone will have to start from the basics again and relearn the language. According to Siwakoti, the changes are completely unnecessary and it would be in everyone’s best interest to revoke the decision. “A few weeks ago we received the book policy written using the new rules of writing and besides the obvious difficulty in reading it, there were many known words that I didn’t understand,” he says. He also mentions that one’s reading and writing fluency will suffer when language undergoes a forceful change. Echoing Siwakoti’s sentiments, Madhav Maharjan, chief of Mandala Book Point, wonders what this change will mean for the recently burgeoning Nepali literature scene and the reading culture that slowly seems to be taking off in Nepal. At a time when youngsters are finally showing more interest in the Nepali language and actually picking up works of the likes of Buddhi Sagar, Amar Neupane, and Kumar Nagarkoti to name a few, this change might prove to be a disincentive to reading. “We should not be averse to change but change should come naturally and not be forced upon us like in the case of our language structure,” says Maharjan. Though Maharjan agrees with the government’s stance that language needs to be easy to learn and grasp, he doesn’t think the proposed changes will make Nepali language any simpler. Rather, he believes, this will just lead to chaos and confusion especially where young students and learners are concerned. Then there’s the fact that language is not only a medium to convey thoughts, perceptions, and sentiments, but it is also a fundamental expression of social identity. Are we losing an invaluable part of our identity by tampering with our script is a worrisome concern for many. Moreover, language isn’t something that can be changed by imposing new rules and laws. It automatically changes over time, following the natural course of its usage. Mina Bayalkoti, a Bachelor of Education student, confesses to being concerned about the government’s decision to impose changes in the written form of our language. She feels this decision might backfire and the reason why the government claims to be doing this – to make the Nepali language simpler – isn’t a logical one at all. “You cannot choose to simplify a language by making changes overnight. It has to happen on its own through the principle of use and disuse. Language should evolve like that,” she says. Echoing her views, Hem Raj Regmi of Aksharaank Pustak Bhandar in Pradarshani Marg says that the ‘new’ written form of Nepali is actually the one that is more difficult and confusing. “I don’t think there are any drawbacks in the way we are used to writing Nepali. This change is redundant,” he says, adding that it is impossible to maintain uniformity in written and speech forms of any language. Even in English, such uniformity doesn’t exist. The people this scribe spoke to were of the unanimous belief that a language is always in transition and thus constantly changing. They believe there is no need to enforce changes in its structure now when it will obviously change with time. “When language goes through natural change, there will be no issue of learning and unlearning that has come up now,” says Kabita Rongong of Ekta Books Distributors. Rongong also mentions that by ‘attempting to make Nepali simple’ we are actually dumbing down the upcoming generation. The allure of Nepali language lies in its complexity, says Rashmi Thapaliya, a law student. Thapaliya believes that one should make an effort to learn a language however it is and the government’s attempt to make it simple will actually undermine people’s ability to learn and their intellect. 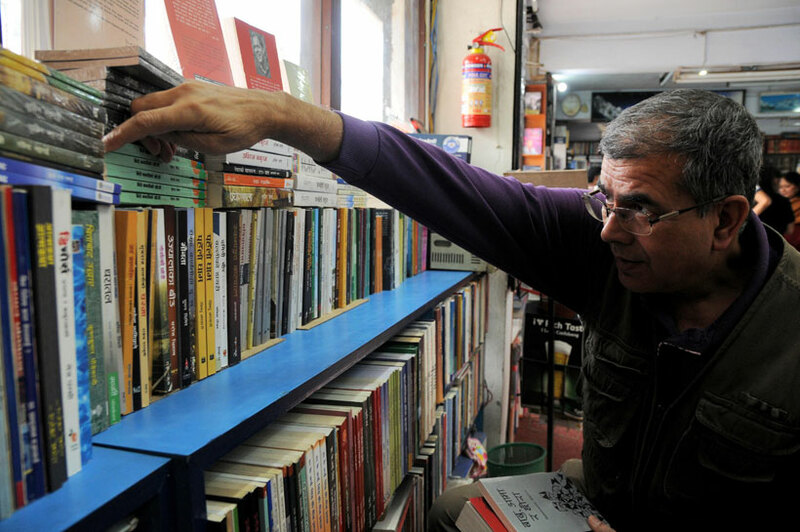 Others, like Pairavi Prakashan’s Siwakoti and Mandala Book Point’s Maharjan, also fear how this change will affect all generations of readers and writers alike. The new generation might not be able to read works of Laxmi Prasad Devkota, Bal Krishna Sama, Parijat, among others who form an important part of Nepali literature. The older generation, who grew up studying and reading the half and joint alphabets, might face difficulties in reading and writing according to the new rules. “Nepali language needs to be easy so that students are enticed to read Nepali books and better their knowledge of the language but we need to focus in the way Nepali is being taught in schools for that. Simplifying it isn’t the solution especially not when it means those who already know the language will have difficulties with it,” says Maharjan. Meera Dhakal, who taught Nepali at Padma Kanya Higher Secondary School for 38 years, agrees with Maharjan and says that she is thoroughly disheartened by the imposed changes in the Nepali language. The fact that these changes happened without much information and discussion upsets her even more. “There should have been extensive discussion before making the changes. It’s not something that should be taken lightly,” she says, adding that now even Nepali language teachers are confused over how to teach their students. However, Ram Lohani, lecturer of linguistics at Tribhuvan University, says that there has been massive miscommunication regarding this issue which has led people to believe that the essence of Nepali language is at stake here. He says that there is nothing wrong with the proposed changes because it just aims to make changes in the script of the Nepali language in order to standardize it. Lohani explains that Nepali has its roots in Sanskrit but there are also words borrowed for other languages and it is this part that is under revision. “Every language goes through processes of standardization. Making changes in the script won’t affect the language,” he says. According to Lohani, it is because people are habituated to the old spelling system that they think the changes will be for the worse but it is definitely not so. Lohani also believes the debate and dissatisfaction have stemmed from the fact that there has been very less information circulation and discussion over the changes. “There needed to be a common consensus before this matter was taken forward but it wasn’t the case. That’s the reason behind all this confusion now. There is an urgent need to hold extensive discussions and clarify people’s doubts right away. It should have been done earlier, but better late than never,” he concludes.